EXP Restaurant + Bar is a video game themed restaurant located on West Pender downtown. EXP originally wanted to have video games that you could play while at the restaurant, but because of silly liquor laws, they couldn’t get licensed to do that. Despite not actually having video games, EXP has a really fun atmosphere with video game music, video game art, and screens playing video game clips all over the walls. For those of you who don’t know me well, I am a self professed nerd and I have loved video games my whole life, so this place has been on my list for a while. I finally got to try this place with Diana from Foodology and Dee from Gastrofork, who are also cool gamer girls. 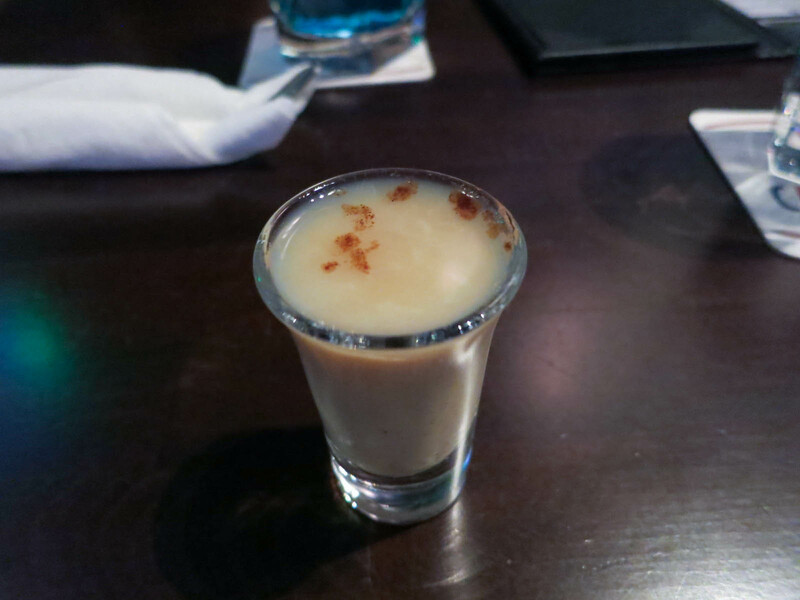 I had the “arrow in the knee” ($5.5) shot that was made with cake vodka and Bailey’s Cream Liqueur. I love that all of the food and drinks here have cute and clever themed names. I ordered this just because the name comes from Skyrim, which is a game I am currently obsessed with. This drink was sweet and tasted just like a birthday cake, but with a boozy after taste. Diana had the health + mana ($7.5), which was a drop shot made with red sour puss, bols melon, blue curacao, and soda. 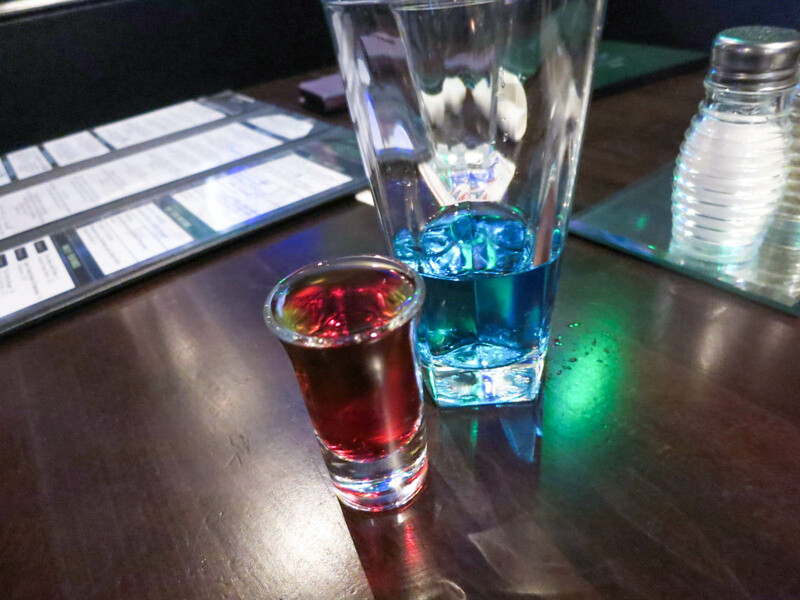 I loved how the drinks came out red and blue, just like mana and health bars! 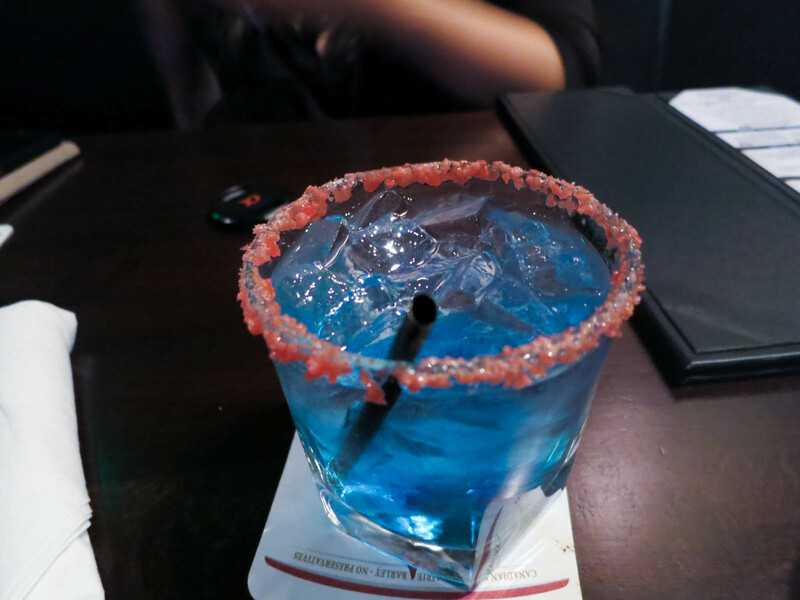 Dee had the Hadouken ($8 the name comes from Street Fighters), which is made with Smirnoff Citrus, Smirnoff Raspberry, Alize Blue, Hypnotiq, and Blue Curacao. 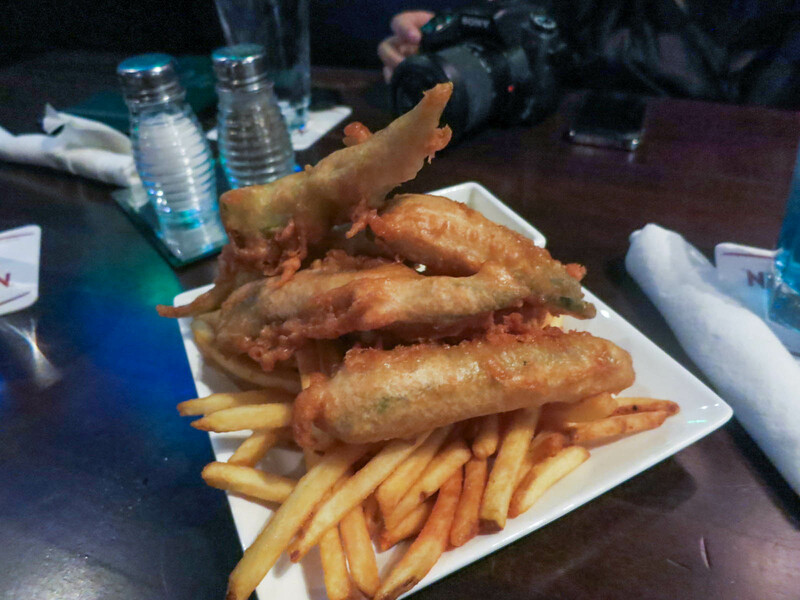 We shared an appetizer called Ultra Deep Fried Pickles ($7). The deep fried pickles had a thick, crunchy batter and were pretty tasty when you dipped them in the mildly spicy blackened jalapeño dip. The fries were also nice and crispy and I couldn’t stop eating them. I had the master chief burger ($13) made with a 6 oz beef patty and topped with baby greens, red onion relish, roasted garlic aioli, and onion rings. 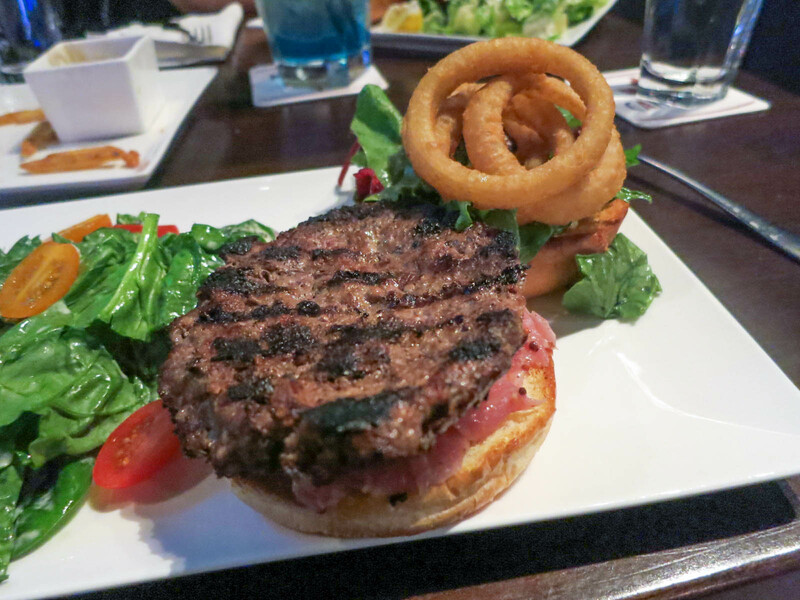 This burger is named after the Halo games, hence the “halo” onion rings. This burger was good and it exceeded my original expectations. The beef patty was thick, meaty, and juicy. I also liked the slight pickled flavour and tang from the red onion relish. The onion rings added a nice crunch to the burger and a greasy deep fried twist. Since we were having tons of greasy deep fried items, I wanted to balance things out with a side salad. I had their house salad and it was light, fresh, and flavourful. 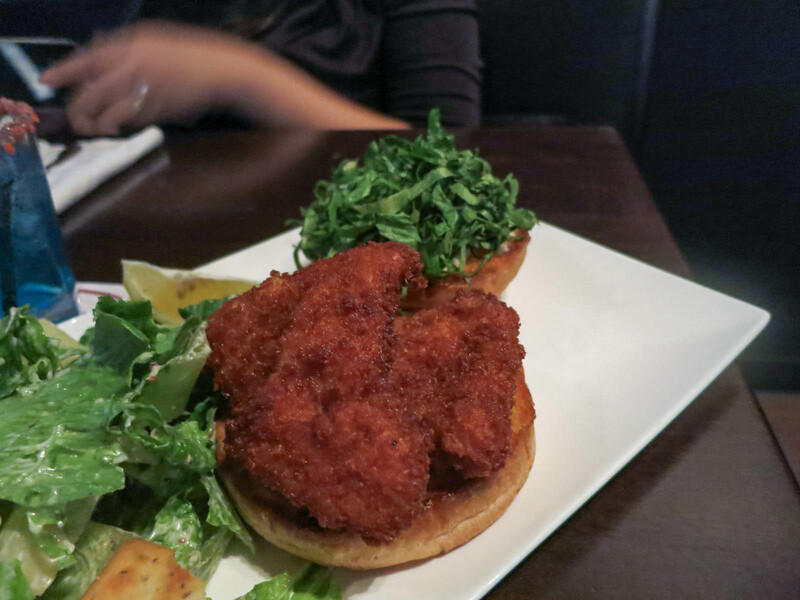 Dee had the chocobo chicken burger ($12), which was made with a crunchy garlic chicken breast, honey mustard, mayo, and lettuce. 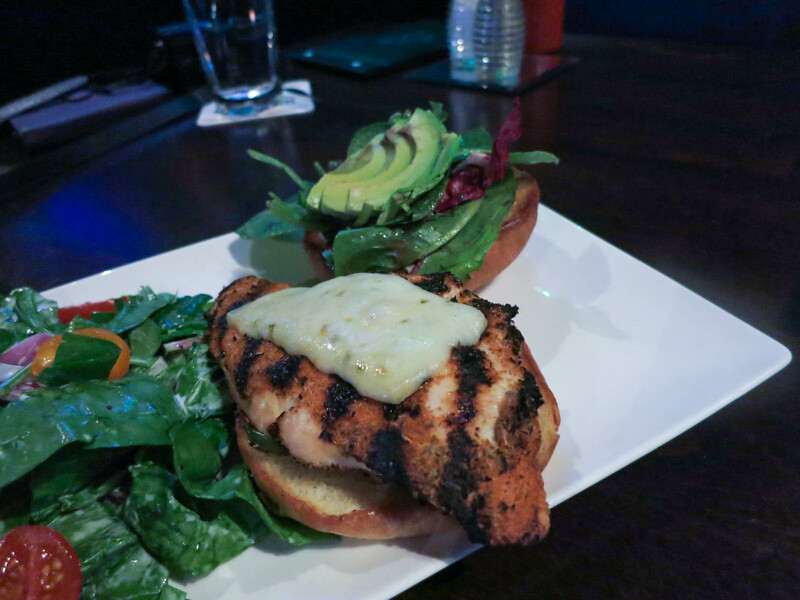 Diana had the raging demon spicy chicken sandwich ($13) made with a grilled Cajun chicken breast, jalapeño jack cheese, fried jalapeño and garlic, and fresh avocado. We decided to share a couple of desserts to end off our meal. 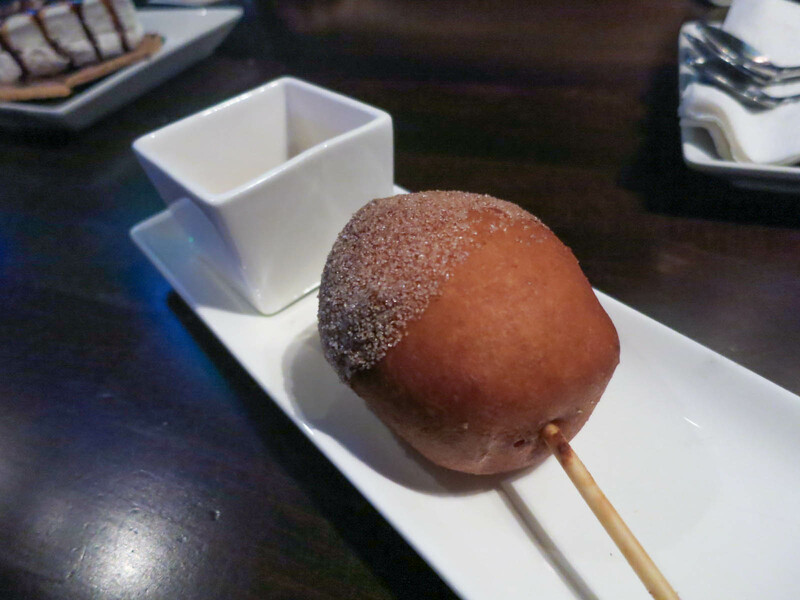 The first was the Doughnut-Shielded Cheesecake ($4), which is a piece of cheesecake encased in doughnut batter and deep-fried. For a topping you can choose between chocolate, Oreo icing, or cinnamon and sugar. This was a heavy, but delicious dessert. I rarely eat cheesecake anymore, so this was like the best thing ever for me. The cheesecake on the inside gets slightly warm and soft and the outside batter tastes just like a mini doughnut. I liked the cinnamon and sugar topping because it added sweetness and spice, but still allowed you to taste the cheesy flavour. 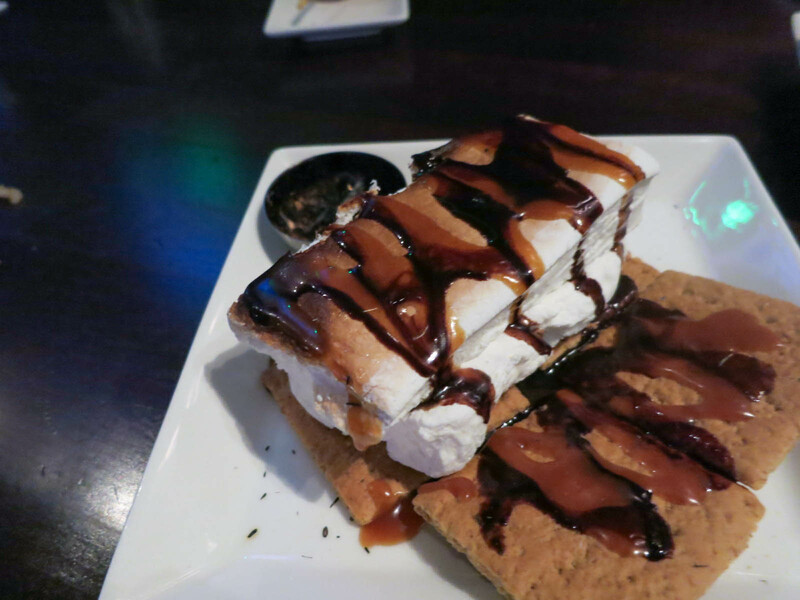 We also had the Smore-Tal Kombat ($5), which is made with house made marshmallow, dark chocolate, caramel sauce, and honey graham crackers. I just love the name of this dessert and I can’t stop saying it. The house-made marshmallows were a nice touch and they were noticeably fluffier and lighter than the store bought kind. I thought this was a fun and simple, but tasty dessert. I also liked how they have a little smouldering candle garnish that simulates the smell of a campfire. EXP is a really cool place that any gamer in Vancouver should visit. Despite not having games, the atmosphere is fun and lively and a good place to hang out with friends. The food was much higher quality than I was expecting from a casual pub style menu and I was happy with everything we had. Yes, for a fun atmosphere and good pub food.